Goal setting is an important part of any effective weight loss programme and it’s usually one of the first things we talk about with our clients. Developing a clear set of weight loss targets will really help you to stay motivated and lose weight efficiently. When we first meet clients, we measure their weight and height, which allows us to determine a sensible healthy weight for that individual. We then work backwards to work out the monthly weight loss targets necessary to achieve the final goal. For most people, we recommend a healthy weight loss of 0.5 kg per week – a rate of weight loss that is achievable with some effort. So if your goal is to lose 15 kg, we develop weight targets based on weight-loss of 0.5 kg per week, achieving the target weight after 30 weeks. This means that instead of having a long-term (and difficult) target of losing 15 kg, you have an immediate target of losing 2 kg in one month. This will look more achievable to you, and will help to keep you motivated. The longest journey begins with a single step – so the monthly weight loss targets help you to progress towards your target weight one step at a time. The monthly targets depend on how committed the individual is. Many of our clients have very aspirational weekly weight loss targets, and healthy weight loss of up to 1 kg (2.2 lb) per week is possible. On our body transformation programmes, clients often have a very clear end-point in mind – possibly a holiday or an important event like a wedding – which motivates them to maximise their weekly weight loss. 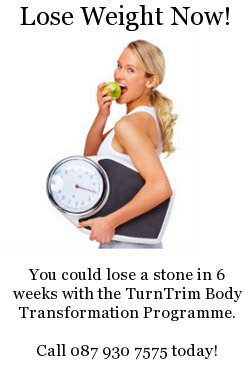 With careful attention to diet and exercise, it is possible to lose up to 8 kg (just over one stone) in six weeks – though not easy! Widen Your Goals: It’s Not Just About Weight Loss! Setting and frequently visualising a range of goals that are linked to healthy weight loss will help you reach your weight loss target. Think about your goals and write them down – what weight you will reach, and when you will reach it. Write down all the things that this will mean for you – how you’ll feel, what you’ll wear, what people will say. Expand your goals beyond simple weight loss, and share your goals with important people in your life. Writing your goals down makes them more real – they become a tangible statement of intent. Write your goals in a diary or a journal and keep them somewhere safe. Refer to them frequently, especially when you’re feeling tempted to give up on your weight loss journey. Read your journal at least once per week. You can also write your goals in your journal, along with a visualisation of how you will look, act & feel when you achieve your goals. Display this picture or object prominently. Use it as your phone/iPad/computer screensaver. Print the image and stick it on the wall or in your car. Keep a small version in your wallet. Is your goal to fit into a certain dress? Take a picture of the dress and use it as a screensaver or print it and use it as a poster. When you are tempted by unhealthy food, look at your “goal image”. This will remind you of what you’re going to achieve – and will help you stay on track. Surround yourself with your goal image. Print a picture for your wallet, stick it on the dashboard of your car, put a picture on the fridge/food cupboard, use the image as a screensaver on your computer and your phone. If you feel a craving for unhealthy food, look at your goal image. Activate your phone and briefly look at your goal image on your screensaver, or open your wallet and look at your goal image. Focusing on your goal in this way will help you to stay on track. Above all else, stay positive and you will achieve your weight loss goals! If you need help with weight loss, give us a ring on 087 930 7575 or contact us. Previous Previous post: Sitting is Bad for Your Health! Next Next post: What Causes Obesity?